In The Name of Allah The Most Gracious The Most Merciful. Our beloved Prophet Muhammad, peace be upon him, told us : ‘Be in the world as though you were a stranger or a traveller.’ [Al-Bukhari,no.6416] Life is a moment. May Allah subhanahu wa ta'ala enable us to live this moment in awe and love of Him, ameen! He is the source of love. The Muslim ummah is suffering a lot due to its own mistakes. We as part of this ummah should try our best to revive this great civilisation insha-Allah. Allah Subhana WA Tawala has assured us, that if we follow the Quran and the Sunnah of our beloved prophet Mohammad SAW, we will be successful in this world as well as in the hereafter. The victory has already been promised to us. So what are we waiting for? Why are we still sleeping? Though we have been provided with the best of knowledge, we are not motivated enough to seek and learn that knowledge. As a result, we lack confidence in propagating Islam the ultimate truth. Unfortunately, most of us are suffering from identity crisis. We are in confusion as the world around us is portraying us as the criminals, the terrorists and so on. It seems like all the negative words are exclusively allocated for us, the Muslims. As everyone else is defining us who we are ( the so called western super powers & the western media) we feel like we have lost the right to say who we really are and what is our purpose in this world. However, Allah swt has already told us everything we must know about us and our duties. We the human beings are the most sophisticated creature on this earth (Asharful Mahklukat) and we need a manual to run ourselves. Allah the Almighty has provided us with that important manual which is the Quran. Subhanallah. Most of us are not aware of the purpose of our existence and the duties towards our lord ALLAH swt. Is it not sheer disgrace? How are we going to stand in front of Him on the day of judgement? What excuses we can come with? I as a Muslim sister feel very frustrated to witness the weakness of our sisters in the ummah. I feel ashamed of our lack of seriousness. As the half of the ummah we women can do so many things to unite the Muslims around the world. According to the so called western values and norms we may be regarded as powerless, oppressed, suppressed, and depressed and so on, but we know very well how Allah swt has gifted us with tremendously huge amount of blessings, alhmadulillah. As daughters, sisters, friends, wives, mothers we can influence and motivate the Muslim ummah to unite under the banner of Islam. Some of my writings will be related to women and their role in uniting the ummah against all the oppression. We need to be more vocal in our work. The media has painted a very wrong and stereotyped image of us and we need to fight back and convey the real message of Islam and how it has honoured us as muslim women, Insha-Allah. I believe internet can be a very useful tool in propagating the real message of Islam and uniting the ummah and bring back the just & powerful Islamic civilisation . I would really appreciate your feedback regarding my writings, May Allah make us carry out our duties to the full extent and grant us jannah out of His unlimited mercy, ameen. May Allah SWT bless our beloved prophet Mohammad SAW and his family and companions and the righteous Muslims who came after them, ameen. Salam alaikum. Peace be upon you. I am a Muslim woman living in London, UK with precious family and beautiful friends . Happily married and blessed mum of three beautiful children alhamdulilah.I love sharing my thoughts about almost everything through writing. Anything good from this blog is from my Lord, Allah subhanahu wa ta'ala and any mistake is solely from me. You can contact me by emailing at editor@aaila.org. Thanks a lot for visiting my blog :) I hope my posts are beneficial bi'idnillah. Happy reading :-) I would love to hear from you inshAllah. Thanks, Jazakallah khairan! Allahumma Anta Rabbi laa ilaaha illaa Ant(a), khalaqtani wa ana ‘abduk(a), wa ana ‘alaa ‘ahdika wa wa’dika mastata’t(u), a-‘udhu bika min sharri maa sana’t(u), abu’u laka bi ni’matika ‘alayy(a), wa abu’u bi dhanbi, fa’ghfir lii ha innahu laa yaghfiru’dh-dhunuba illaa Ant(a). O Allah, You are my Lord. There is no god but You. You have created me and I am Your servant and as far as possible I abide by Your promise and covenant (which I made with You). I seek Your protection against the consequences of my wrongdoings. I fully acknowledge the grace You have bestowed upon me and confess my faults. So pardon me as none besides You can pardon sins. He who seeks to do justice with men, let him desire for them what he desires for himself. Allahumma inni as'aluka' l-hudaa wa 'ttuqaa wa 'l-'afaafa wa 'l-ghinaa. O Allah, I ask of You guidance, piety, chastity and independence [from Your creation] (Muslim). Allahumma Musarrifa 'l-quluub(i), sarrif quluubanaa 'ala taa'atik(a). O Allah, Turner of hearts, turn our hearts toward Your obedience (Muslim). Yaa Muqalliba 'l-quluub(i), thabbit qalbi 'alaa dinik(a). O Controller of the hearts, make my heart firm in Your Religion (Tirmidhi, Mustadrak). Allahumma inni a-'udhu bika mina 'l-'ajz(i), wa 'l-kasal(i), wa 'l-jubn(i), wa 'l-haram(i), wa 'l-bukhl(i), wa a-'udhu bika min 'adhabi 'l-qabr(i), wa a'udhu bika min fitnati 'l-mahyaa wa 'lmamat(i). O Allah, I seek Your protection from inability, laziness, cowardice, decrepitude and miserliness and I seek Your protection from the punishment of the grave and I seek Your protection from the mischief of life and death (Bukhari). "Knowledge is not merely the narrating of texts. Rather, knowledge is fear of Allah SWT." "Do not make people hate their Creator by your action!" "The best among you is the one who learns the Qur'an and teaches it." "A child will make love stronger, days shorter, nights longer, the home happier, the past forgotten and the future worth living for, alhamdulillah!" ‎"So what legacy will we leave behind that will continue to benefit us after we pass away? Truly, this is the best way of doing business, a business wherein we are preparing an exit strategy and one which continues to benefit us even after our demise." "When one door of happiness closes, another opens, but often we look so long at the closed door that we do not see the one which has been opened for us." "We buy things we don't need with the money we don't have (loan) to impress the people we don't love!" "Believing gives a purpose, to live a fulfilling life, to cultivate the humanity, to try to reach the full potential. It's so satisfying to think we are created for a reason, we're part of the flow of the universe, our existance contribute to it. A purpose driven life is so much more better than a life without meaning.... Even if there's no reward waiting after this life.So I choose to believe!" Birth blogs "Every birth is unique." Allah (swt) is the Most Merciful ! Remember that Allah forgives those who ask Him for forgiveness, and He accepts the repentance of those who repent and He accepts those who come back to Him. 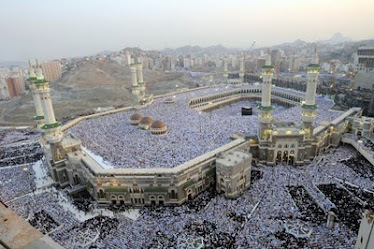 What an amazing place subhanallah! Can you spot the Mountain of Noor ( Light) ? Umm Imran Sumaiya (Copyright 2006-2011). Simple theme. Powered by Blogger.